Villa Cantellops has a large private pool and spacious terrace for relaxing and dining alfresco - a true taste of the Spanish lifestyle. There are also picturesque mountain views to enjoy, whilst the interiors are homely and inviting. 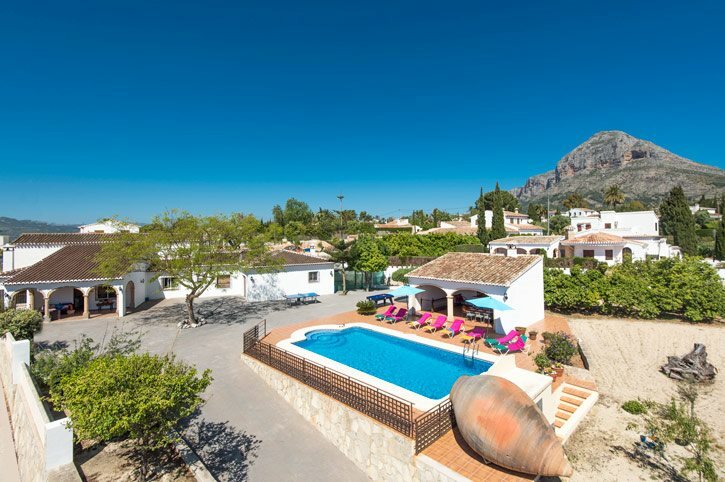 This 5 bedroom villa is located in the Javea countryside with a vast selection of shops, bars, restaurants and Arenal Beach under 15 minutes' drive away. WiFi and air conditioning/heating in the bedrooms are included. The large pool and spacious terrace, BBQ house and mountain views. A great pick to get away from it all! The large pool takes centre stage with plenty of space surrounding it for relaxing on one of the sun loungers with a good book and absorbing the pleasant mountain views. By the poolside is the BBQ house, equipped with a dining table and chairs and work surfaces for preparing some tasty food before dining alfresco. The covered terrace has a seating area and coffee table where you cool off with a drink. Entry into the villa grounds is via electric gates and up the driveway to the parking area. The front door is on the covered terrace and leads into the lounge/dining area. The lounge/dining area has a traditional feel due to the terracotta flooring, open brick work and beamed ceiling. There is a seating area at one end along with a flat screen TV, and a table and chairs to the other. The fully equipped kitchen is adjacent and has a small breakfast table where you can enjoy your morning coffee. On the ground floor there is 1 twin bedroom, a separate shower room and 1 double bedroom with an en suite shower room. Upstairs are the remining bedrooms - 2 twins and 1 double - which have use of a separate bathroom. All bedrooms are homely and comfortable. This villa has applied for a licence with the Generalitat Valenciana and the application number is 22000/2018/19790. The licence number will follow. This spacious villa is within easy reach of places to explore in and around Javea. The popular Arenal Beach and promenade, with its golden sands and abundance of shops, bars and restaurants, is worth a visit. Or, for a spot of culture, there's the authentic Javea Old Town and its cobbled streets, as well as a selection of amenities. Both areas are within 15 minutes' drive. The areas of Moraira and Gata are also within easy reach by car. Javea has an open-air market every Thursday morning, where you can find a great variety of produce from shoes to fruit and vegetables. It's a great place to spend the morning, followed by some tapas and a cool drink in one of the bars or restaurants. There's also a morning undercover market every day, which is to the side of the church in the old town. There's a diverse choice of bars and restaurants lining the Arenal Promenade in Javea, serving everything from burgers and chips to a tasty paella. Alternatively, to sample 'the catch of the day,' why not head to Javea Port where there are some waterfront restaurants? And in the authentic old town in Javea there are many restaurants dotted along the cobbled streets. Arenal Beach in Javea is a blue flag beach with soft golden sand and clear waters. The promenade lines the beach and stretches for 1½ miles, less than 15 minutes' drive away from the villa. There's also the pebbly La Grava Beach near the port. Javea has several paddle tennis courts, which is a cross between tennis and squash. There's also a local tennis club and lots of water sports to try. Or, why not play a round of crazy golf or compete against each other on the go-karts at Laguna Ribs? Alternatively, perhaps head to Benidorm and visit the Terra Mitica Theme Park. There are gentle rides for children and, for the thrill seekers, some great rollercoasters. For a change of scenery, venture to the upmarket resort of Moraira, which is 25 minutes' drive away. There's a beautiful Marina lined with restaurants and bars where you can watch the world go by. Or, a trip to Guadalest is worth the drive, just over an hour away. One of the most famous landmarks here is the Penon de la Alcala Tower, which rises high above the village with views of the valley below. There is a 9-hole golf course near Benitachell on the outskirts of Javea, or a championship course at the Marriott Golf and Spa resort on the road to Denia from Javea. Villa Cantellops is not available to book for season as it is sold out. Take a look here at the Costa Blanca villas that are currently on sale.